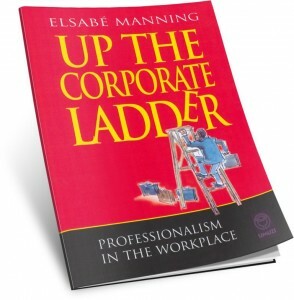 Up The Corporate Ladder is a practical guide to what true professionalism and competence entails, this book guides one through all manner of business interactions, from how to conduct oneself professionally while meeting with people from other cultures to the often overlooked rules of e-etiquette. Topics include: time management, networking, self-sabotage, travel etiquette and dressing for success. “Success in the workplace is not just dependent on intellect or technical skills. 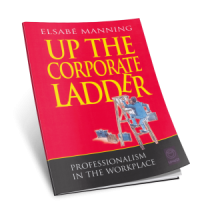 It is highly dependent on a set of behavioural standards that mirror the values and the brand of the company and that set you aside as a ‘class act’ … This book is invaluable for business people who are seeking to refresh their skills and brand themselves as professionals.” – Italia Boninelli, Group Human Resource Director, Netcare. “In a world of limited second chances, Elsabe’s book is a welcome contribution to the increasing number of emerging professionals and entrepreneurs who have to compete on a global stage.” – Tim Modise. Published by Umusi, an imprint of Random House.